This is a repost that originally appeared on the Couchbase Blog: Geospatial Search with ASP.NET Core, Aurelia, and Google Maps. Geospatial search is now fully supported in Couchbase Server 5.5. Check out the Couchbase Server 5.5 announcement, and download the developer build for free right now. In this post, I’m going to demonstrate the geospatial search capabilities of Couchbase Full Text Search by creating a web-based UI that performs searches. Whenever I think of geospatial searches, I think about Yelp, which is great at helping me find restaurants in a specific area. So I’m going to have a little fun and create a very bare-bones version of Yelp, but only for hotels. If you want to follow along, the full source code is available on Github. Here are the steps I took to create a new project before I started writing code. At the command line: dotnet new aurelia. This assumes that you have .NET Core installed. Note that Geospatial Search is not a .NET-only feature: you can use it with the other Couchbase SDKs like Node.js, Java, etc. It also assumes that you’ve installed a SPA template for Aurelia. You can also go with Angular or React if you’d like, but I really like Aurelia, and I think you should give it a chance. The above command will create a shell of an ASP.NET Core project. In this blog post, I’m not going to use Razor. I’m just using ASP.NET as a backend for REST API endpoints. npm install aurelia-google-maps. You don’t have to use this, but the aurelia-google-maps plugin will make it easy for me to interact with Google Maps in my app. I opened this project in Visual Studio 2017. I added Couchbase.Extensions.DependencyInjection with NuGet. You don’t have to use this extension but it makes things easier. I installed Couchbase Server 5.5, including the Full Text Search service. I setup the travel-sample bucket. I created a user "matt" with full access to that bucket. Before building the ASP.NET backend, we need to create a geospatial index in Couchbase Server. Once you log in, click "Search" on the menu (it’s under "Workbench"). Click "Add Index" to get started. I named my index "mygeoindex". I selected travel-sample as the bucket to index. In "Type Mappings", I uncheck the default. I add a new type mapping with a type name of "hotel". Every hotel document in "travel-sample" has a type with a value of "hotel". Check the "only index specified fields" box. I’m going to add two child fields. One is "geo", which contains the geospatial coordinates inside a hotel document. Make sure to select "geopoint" as the type. The other is "name", which will be the name of the hotel. I choose to "store" each of these: it will make the index larger, but I can avoid a secondary lookup if I store the information in the index. Important Note: There is a bug (NCBC-1651) in the current release of the .NET SDK that will cause an error if you try to read from a geopoint field. In the code samples, I’ve created a workaround: I don’t actually get the geo & name fields from the search index. I instead use the document key returned by search to make a secondary "get" call and get the full document. Keep in mind this is still a technique you may want to consider if you want to keep the size of your index down. This bug has already been fixed and will be in a future release. Such is the peril of being on the cutting edge! That’s all there is to it. Click "Create Index". Watch the "indexing progress" on the next screen until it gets to 100% (it should not take very long, assuming you remembered to uncheck "default"). Next, let’s move over to ASP.NET. I’ll create two endpoints. One endpoint will demonstrate the bounding box search method, and the other will demonstrate the distance search method. I’ll need a Couchbase bucket object to execute the queries. Follow the examples in my blog post about dependency injection or check out the source code on Github if you’ve never done this before. A "bounding box" search means that you define a box on a map, and you want to search for points of interest that are inside of that box. You only need two points to define a box: the top right corner coordinates and the bottom left corner coordinates. (Coordinates are latitude and longitude). To create a bounding box geospatial query, use the GeoBoundingBoxQuery class available in the .NET SDK. I’ll do this inside of a POST method with the above BoxSearch class as a parameter. All I need to return from this endpoint is a list of the results: each hotel’s coordinates and the hotel’s name & location. I created a GeoSearchResult class for this. I’ve constructed this class to match the Google Maps plugin that I’ll be using later. Finally, I’ll use this class to return some results from the endpoint. A "distance" search is another way to perform geospatial queries. This time, instead of a box, it will be more like a circle. You supply a single coordinate, and a distance. The distance will be the radius from that point. I’m defaulting it to miles, but certainly you can use kilometers instead, or present the option in the UI. The endpoint will be very similar to the bounding box endpoint, except that it uses GeoDistanceQuery. At this point, you can start testing these endpoint with Postman or Fiddler if you’d like. But it will be so much nice to see this on a map. 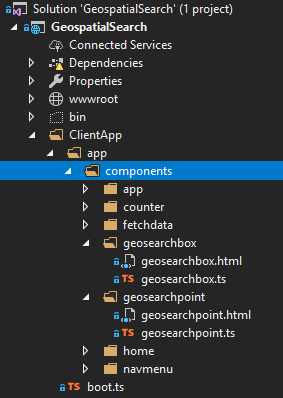 In Aurelia, I’ve created two components: geosearchbox and geosearchpoint. Each of them will have a Google Maps component that the user can interact with. These maps will be centered on San Francisco, because that’s where a lot of the hotels in "travel-sample" are located. markers is simply an array containing coordinates of search results that should appear on the map. Initially it will be empty. Then, click another spot on the map. This will set the second coordinate (bottom right). Implementing the "distance" geostatial query will be similar to the bounding box UI. This time, you only need to click a single point on the map. But, you will need to type in a distance (in miles). Specify a distance (in miles), and then click 'search' to make a POST request to the endpoint we wrote earlier. Below is a clip of the search in motion. Note how the results change as I move the coordinate around. With Couchbase’s built-in geospatial indexing and search feature, all the math and the searching is delegated to the Couchbase Data Platform. So you can focus on building a killer UI (better than mine anyway) and rock-solid business logic. Be sure to check out the documentation for a complete overview of the geospatial capabilities of Couchbase. If you need help or have questions, please check out the Couchbase Server forums, and if you have any questions about the Couchbase .NET SDK, check out the .NET SDK forums. If you’d like to get in touch with me, please leave a comment or find me on Twitter @mgroves.